"Even before she left her native Vienna for the court of France in the spring of 1770, the young princess received an intensive crash course in the Bour­bon approach to looks, dress, and public image. She was redesigned from tooth to coif, and a renowned French dance instructor trained her to move gracefully while wearing high heels, hoopskirts, and a hefty, cumbersome train. Her appearance, her elders ceaselessly reminded her, would make or break her success as a French royal wife. "Yet from her earliest days at Versailles, Marie Antoinette staged a revolt against entrenched court etiquette by turning her clothes and other accou­trements into defiant expressions of autonomy and prestige. ... Initiating a lifelong series of bold stylistic experiments (which one aristocratic contemporary described as constituting 'a veritable revolution in dress'), she challenged received wis­dom about the kind and the extent of the power that a French royal consort ought to possess. "Traditionally, such power was severely curtailed by a principle known as Salic Law, which excluded women from the line of royal succession. Except in cases where a widowed queen acted as regent for a son still too young to rule on his own, the role of the French king's wife was restricted principally to her ability to bear royal children. But for the first seven years of her marriage to Louis Auguste, who became King Louis XVI in 1774, Marie An­toinette found this avenue closed to her. 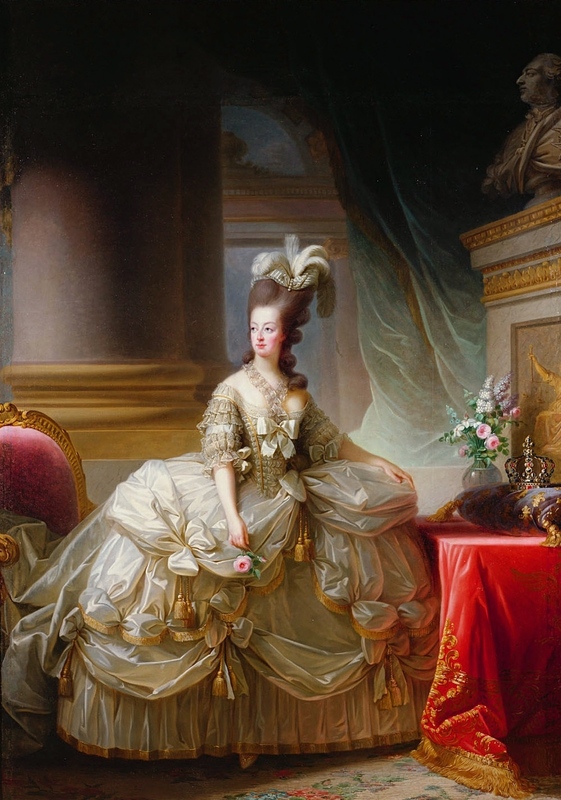 Because of a combination of de­bilitating psychological and sexual reticence, her young spouse refused to consummate their union, and this put Marie Antoinette -- married off to ce­ment a political union between Austria and France -- in a profoundly uncom­fortable position. ... Marie Antoinette's own place at Versailles would not be secure unless she gave the Bourbon dynasty an heir. Until that day, the many French courtiers who deplored the alliance (designed to reverse a centuries-old enmity between the two nations) would not hesitate to push for her replacement by a more fertile princess. "But more often than not, her rebellion in dress generated or exacerbated grievances among both contingents, to the point where the nobility and the populace, worlds apart on so many political issues, reached an explosive consensus about their hatred of Marie Antoinette. Like Claudius, the illegitimately enthroned 'king of shreds and patches' thought by Shakespeare's Hamlet to personify the whole of the rot­ten Danish state, this queen of poufs and feathers came to emblematize the worst aspects of royal privilege -- and the best reasons for revolution."